Home » Discover Staunton » What Style Is It? Greek Revival. 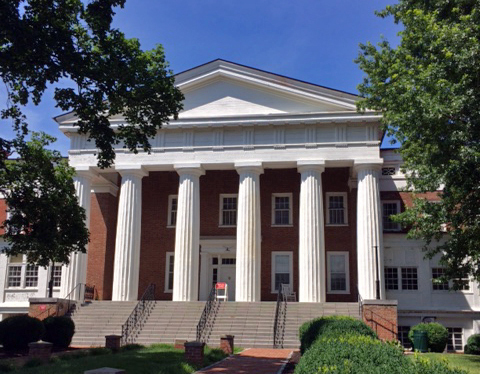 This imposing building is the administration office for the Virginia School for the Deaf and Blind. 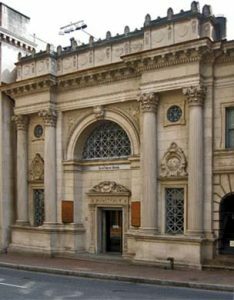 Started in 1838 and completed in 1846, this impressive building designed by Baltimore architect Robert Cary Long Jr. is a perfect example of a Greek Revival building: a temple-like structure echoing Greece and the birthplace of democracy. 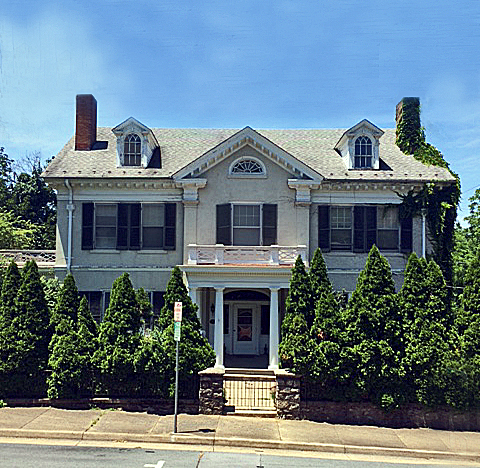 Greek Revival building started around 1825 and continued up to the Civil War. This style was popular for churches, houses, commercial buildings, and especially public/municipal buildings. Greek Revivals were designed with columns and pilasters, and most often topped with Doric-style capitals holding up a gable front. Most of the federal buildings in DC are in the Greek Revival Style. Art Deco. 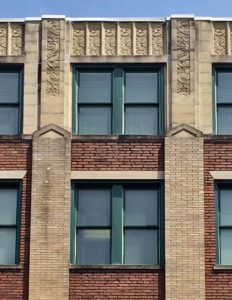 Popular from 1925 to 1940, this ventricular looking building on the corner of New and Frederick Street is Staunton’s rare example of Art Deco, built in ( ). Even though the Art Deco craze was popular in art, fashion, furniture, and even automobiles, the skyscraper is where it’s most recognized. Art Deco materials consisted of stucco, concrete or terracotta. Steel and Aluminum were used along with glass blocks, forming geometric shapes, with vertical lines, and often applied with decorative floral patterns. Art Deco was a streamlined look that was popular with hotels, commercial, and public buildings. Vernacular. Built between 1886 and 1891, this old telegraph office, now repurposed as the Amtrak waiting room, is an example of vernacular style. This design was based on local needs, the availability of local materials, and is more a reflection of local craftsman and builders, rather than an architect. 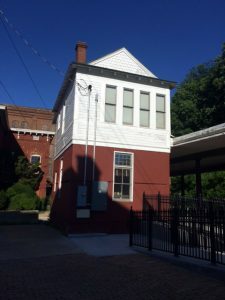 Here, the gable roof with a sawtooth brick sting on the first level, with fish scale shingles on the gable ends, and with brackets supporting the overhanging roof, is a great example of local builders constructing a functional building for the railroad company, while also exhibiting local materials and styles. Shingles. 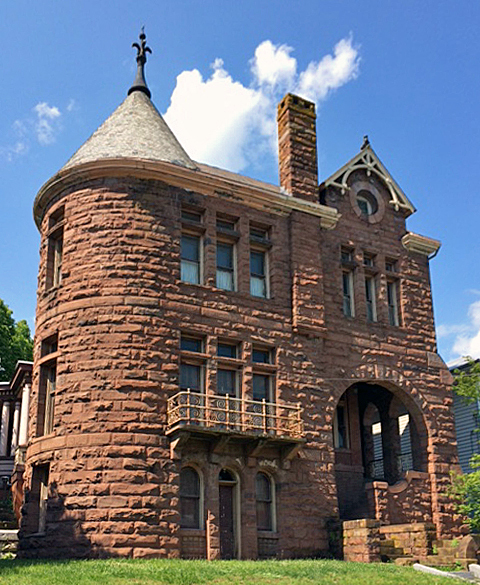 This house on Berkeley Place was built in 1897. Shingles style is noted for its decorative friezes and leaded glass windows. 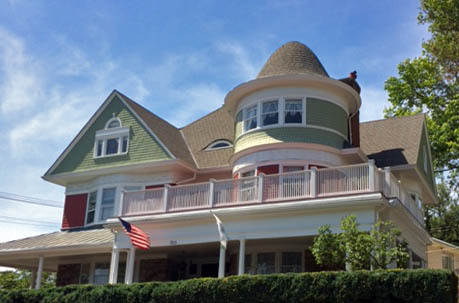 Shingle houses sometimes have a complex hip and or gable roof with a turret – like this one – and often exhibit a balanced design, and are completed with either plain or decorative cedar shingles. The Shingle style ran from 1880-1900, mostly in New England, where it became popular for seashore homes, as the large porches and balconies encourage a more outdoor feeling and enjoyment. East Lake. This 19th century movement was started by Charles Eastlake (1836-1906). Basically, “simpler” details of late Victorian (1839-1901) architecture. East Lake has decorative styles of geometric ornamentation, spindles and low relief carvings. The style can also be related to interior design work as well as furniture. Bungalow. 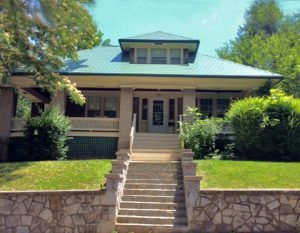 Known as the Arts and Crafts movement (1900-1935) the bungalow is usually 1 1-1/2 stories tall with low pitched roof lines on a gable or hipped roof with deeply hanging eaves, heavy brackets and a front porch. The bungalow also had an open floor plan with virtually no hallways. Classical Revival. A uniquely American style that is essentially a mixture of many styles. 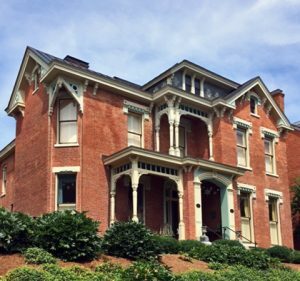 Prominent features are: typically 2-storied with gabled, hipped or gambrel roof styles and dormer windows; and symmetrical front look with classical porch and evenly-spaced columns over front door. The revitalization of Colonial Williamsburg in the 1930’s helped broaden interest in this style across the country. Beaux Arts. Characteristics include rich, heavy ornaments with slightly over scale details (especially over windows), arched and round windows, and symmetry with classical details.